I can't believe I found the time to make this. I actually considered not doing one...or having it show up days late. But then I thought to myself, "WUSS! DON'T BE A SISSY LA-LA! GET IT DONE!" And so I did. The last week has been the most hectic week I've experienced since...since maybe the weeks up to my wedding day! I can't remember feeling this overwhelmed, anxious, and completely booked! Between the awesome (and super blessed) Etsy orders, emails, Sweet Lavender blog button swap (which was responded to beyond my expectations!! So excited for this), editing pictures, submitting stuff to different sites, and you know- life...I literally blink and it's time for bed. Last week- TOTALLY DIFFERENT. I actually stood in the middle of my living room at one point during the week and went, "Hmm...what to do. Maybe I'll vacuum..." <---Pfffffffft. And then last night, after I was completely exhausted and wanting to snuggle in bed and you know...watch some DC (Dawson's Creek for those of you just tuning in)...our Netflix didn't work. Like, at all. Wouldn't even load enough to turn on. Lovely. I felt like my friends were ripped from my arms! And yes. I am completely aware of how childish I sound right now. It happens. So come time to make a desktop calendar I was like "YEAH RIGHT! "....but then I was like, "Uh, yeah. Right!...gotta get to it." 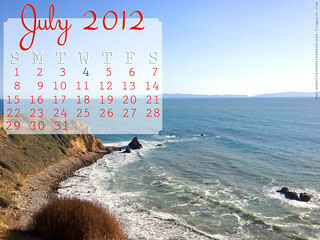 So Happy July friends!!!!!!! July is by far the busiest month these Mains have all year. Every year. Maybe I'll take a picture of our hanging calender for you all to see. EVERY SINGLE day has either a commitment or birthday on it. IN red. To really emphasize the busyness. Included in the madness are things like: Sweet Lavender's Birthday!! !, baby Mustachio's birthday!! !, and my husband's birthday!!! Plus about 10,106 other birthdays. Yeah that's totally a true story. We have 326 birthdays a day, in July. My husband alone has 3 family members' birthdays this month! Sheesh. Enough about birthdays. And complaining.